If there’s a problem with Coates’ argument, it’s that he avoids committing himself to any one form of reparations. Some kinds of reparations are helpful, and some kinds are not—and the differences matter profoundly for the legitimacy of the case. Indeed, conservative critics have already taken Coates to task by deploying the common understanding of reparations—cash payouts—as an argument against it. Would it entitle anyone who can prove even a trace of African ancestry to a pay check? In any event, would cash payment actually bring about the “the full acceptance of our collective biography and its consequences”—the broader point of Coates’ essay? 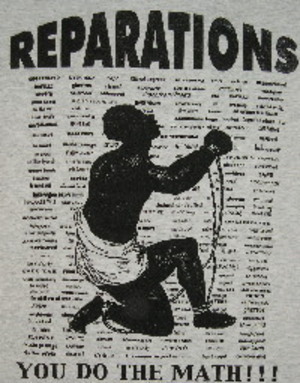 If the narrowest definition of reparations, like cash payouts, is deemed legitimate, then its critics have many good points to make. Yet if we take what the leading advocates for reparations actually do suggest, many of whom Coates cites approvingly, reparations becomes a far more palatable policy. Charles Ogletree, the leading American legal scholar in favor of reparations, has argued for a (perhaps too) broad definition that would focus around job training for poor African Americans and even all the nation’s indigent. Other possibilities include a massive investment into blighted black communities; school vouchers for black students in neighborhoods with failing schools; free pre-K and daycare for financially strapped black parents; a reinvigorated campaign for race-based affirmative action; federal laws criminalizing predatory home loan policies that disproportionately harm black citizens; restructuring our prison system to redress the blatant ways it criminalizes blackness. If all these policies sound familiar, that’s the point. Activists fighting racial discrimination have been making these arguments for years, with only limited success. Reading Coates’ many critics, it became clear to me that he might be able to persuade a good portion of them if he would just commit to a stricter range of options. Skeptics like John McWhorter essentially back all these race-based reforms, but dismiss Coates’ argument based on the assumption that it means something like a cash payout. Unlike Coates, I think the specific answers matter. We need policies that target clear forms of institutionalized racism. Though I support Coates’ case for HR 40, I’m not sure how much it will actually provide the historical understanding Coates hopes for. Nonetheless, I do think Coates is at his most convincing—and offers me, a student of slavery, profound encouragement—when he argues for our collective need, as a society, to have a deeper appreciation for the centrality of slavery to our nation’s past, and our present. If there was ever a case for why history matters, Coates makes it. Ta-Nehisi Coates’ essay on reparations has created a firestorm. Eric Herschethal at The Junto jumps into the discussion and points out that Coates is not demanding cash payments. Instead Herschethal argues that Coates appears to support job training, school vouchers, free preschool and daycare, and investment in poor African American Communities and affirmative action laws. Herschethal acknowledges that Coates’ demand for reparations is far more reasonable than he initially thought.